Stop buying legal tech if you are just curious about it, but if you have a problem that needs resolving then do buy legal tech that will resolve it. You are then not just buying legal tech but resolving a problem. So what is going on? DeStefano aims to answer this question. She has spent years researching the legal marketplace and works with both law students and experienced legal practitioners to help them embrace innovation. Her practical book aims to explain how lawyers can ‘hone mindsets, skills and habits that clients desire - and in the future that clients will require’. It is in 3 parts: why lawyers should change; the approach they should take; and an outline for a practical methodology to make this change happen. 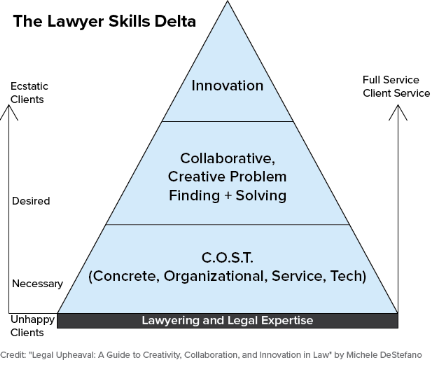 The graphic representation of DeStefano’s research outcome is demonstrated in this ‘Lawyer Skills Delta’ pyramid. It is a clear illustration of the challenges that lawyers are facing. Lawyering and legal expertise form the base of the pyramid, but as the legal industry has realised, clients and the world at large are demanding more. Level 1: The acronym COST (Concrete, Organisational, Service, Tech) sets out the basic necessary requirements. Lawyers need industry knowledge, business mentoring skills and acumen, with social, marketing and tech knowhow, but above all, the ability to communicate clearly. Level 2: ‘Collaborative, Creative Problem Finding and Solving’. This is where lawyers can truly demonstrate their softer skills of empathy, inclusivity, and self awareness. This is where listening to clients becomes essential; not information gathering and sales exercises, but truly getting to know that industry. Level 3: ‘Innovation’ where lawyers demonstrate a truly inclusive culture; working with clients the way clients want them to. Ultimately the levels within the pyramid are not goals per se, but instead require a change in mindset - to absorb and inhabit. DeStefano points out that the mindset and behaviour which made a lawyer traditionally ’successful’ are the same elements which inhibit innovative thinking. She calls this phenomenon a ‘skills handicap’ because skills must be unlearned first. She concludes that ‘resistance to change, fear of failure, introversion, and a desire to avoid risk combined with being hired to serve as a specialized expert, all contribute to the skills gap’ (p68). 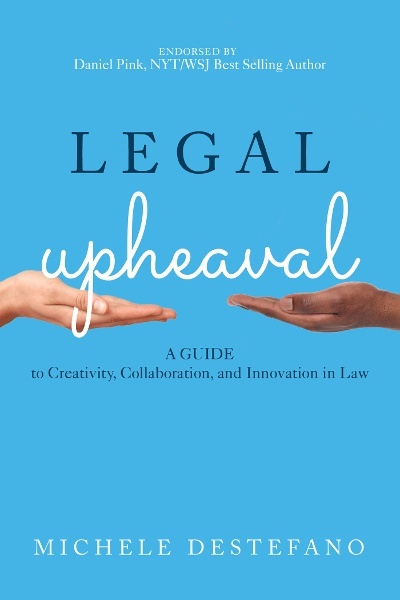 The second part called ‘The Three Rules of Engagement: creating a culture of creativity and collaboration’ focuses on specific approaches to successfully embracing legal industry upheaval. The Rules of Engagement are designed to help lawyers unlearn their mindsets. It involves having an ‘open mind’, an ‘open heart’, and an ‘open door’ - this is level 2 in the ‘Lawyer Skills Delta’. Perhaps it is the terminology, but this is where some legal reviewers have admitted their - natural - scepticism. However some of the general precepts presented in this section are illuminating. DeStefano’s observations about ensuring equal airtime in meetings are insightful; when an idea is presented there is a natural tendency for maintaining hierarchical ownership of it. However only when there are collaborative and multiple ‘yes...ands’ can that initial idea be developed into ‘the one’. Open, ‘crowdsource’ mentality must be cultivated in the workplace, just as they are in many successful voluntary and community events. Working together goes to the heart of these rules of engagement. The practical third part of this book is where the fun starts. Among other things DeStefano recommends artistic and musical games to bring teams together during KickOff. Although this is where she might lose some readers, in my experience, the most successful sessions at conferences have been where creativity is encouraged. For instance simply putting modelling clay on tables. People interact, build relationships, and can begin to work together effectively. She recommends initiating an ‘abbreviated innovation cycle’ as soon as possible. This could be a weekend hackathon, or a mini project. ‘They find a problem, fine tune a target audience and a create a consumer story, create a solution, develop a pitch deck, and pitch the problem and solution to the entire audience in 10 mins or less’ (p160). DeStefano goes on to outline the Ignite presentation format, and whilst this is nothing new, the 5 mins and 20 slides remains a challenging format requiring practice and discipline. Something we should all try, in my view. This stress on clarity, brevity, process and planning continues throughout this practical chapter. The sample programme timeline is perhaps reminiscent of an agile workflow, with emphasis on regular meetings and milestones to maintain the innovation cycle momentum. Each phase, week and milestone is outlined in detail, with questions to get you thinking. Team members will have defined roles according to skill, but senior members of the organisation must ensure a flat hierarchy to ensure success. The organisation has to recruit the right people to ensure legal innovation. It is unwise to make predictions about where the legal industry is going; for now it is enough to know that firms must innovate or die. My experience over the past 20 years reflects DeStefano’s definition of innovation, ‘lasting incremental change that adds value yet appears small on the surface’ (p203). For instance it is now standard for firms to align departments across sectors/industries, as well as participate in client/firm personnel exchange schemes. More recently, law firms are embracing agile working so that they can better anticipate the needs of clients. Ultimately we have to remember that law is, and always will be, a creative industry. Lawyers are skilled in assimilating information and solve problems by making connections. This knowledge is attained through conversations, past experience, exhaustive research or excellent team work. This is how the law has developed - rarely does an existing problem follow precedent exactly, so the best lawyers are those who can think outside the box. The industry needs to capture that existing creativity and apply it in innovative ways - just as we do at Vable. As DeStefano concludes, the direction is only ‘up in a way that has never been possible before!’. And that can only be a good thing for all of us in the innovative industries - legal or otherwise. Do you think all this is happening already? Or do firms need more encouragement? What do you think of DeStefano's terminology? Have you been part of an innovation cycle?